All photos courtesy of James Ransom for Food52. It’s that time of year again. Time for us all to be bombarded with endless headlines about slimming down, eating clean, fasting, dieting, portion control, and the like. I greet the tsunami of body makeover messaging that accompanies the New Year with a grain of salt at this point, though it used to drive me bonkers. This year, as the slim down plans and the “3 weeks to a new you” tips roll by, let’s all stay focused on business as usual. For me, business as usual means the creation of beautiful food. Which is why I was excited when the Food52 editors asked me to write about winter salads. Even the most enthusiastic of salad eaters will occasionally complain to me that salads just don’t cut it in winter months. While there’s nothing wrong with steaming or roasting your winter veggies, I still think there’s a lot to be said for eating dark, leafy greens in both cooked and raw form. 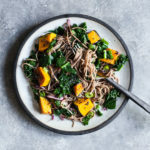 If you’re turned off by the idea of a big bowl of cool veggies, you’ll love my tips for adding cooked grains, winter squash, and other hearty add-ins to your salad meals. In today’s Food52 post, I’ll tell you all about my tricks for turning a winter salad into a hearty, satisfying dish. 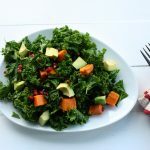 And I’ll share a salad of kale, kabocha squash, pomegranate seeds, and toasted hazelnuts, which is absolutely wonderful. It was inspired by my bitter, salty, sour, sweet salad (which, alas, did not win the salad’tude contest, but HUGE thanks to those who voted!! ), and it’s a marvelous combination of textures and flavors. As an ardent champion of meal sized salads, this post is near and dear to my heart. I hope you’ll head over to Food52 to check it out, and perhaps comment on some of your favorite winter salad recipes! Bitter, Salty, Sour, and Sweet. Kale Salad with Roasted Kabocha Squash and Cauliflower, Candied Pumpkin Seeds, Goji Berries, and Turmeric Lemon Vinaigrette. 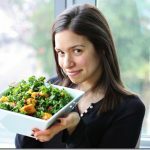 My Entry to the Show Me Your Salad’Tude Contest!! Winter salads are a great idea and I’m going to be looking for more recipes for them than ever before once the new year starts! I love this recipe, Gena! I absolutely love putting warm squash on crisp, cool greens. And this combo sounds perfect. I make a similar salad with roasted cauliflower and sherry vinegar in the dressing (http://www.guardian.co.uk/lifeandstyle/2011/dec/23/haddock-bean-salad-cauliflower-recipe) or this kabocha salad: http://www.101cookbooks.com/archives/roasted-winter-squash-salad-recipe.html – quite possibly my two favourite winter salads! Or your orange-walnut dressing with kale, hot roast parsnips, butter beans and avocado. I adore putting hot veg on a raw kale salad and adding chopped avocado so everything gets just ever so slightly warmed through. I will confess that the “new you” stuff still drives me bonkers, even though I don’t actually get wrapped up in it anymore. Always good to hear your voice of reason Gena! I love that you call them “meal sized salads”. It’s hard to convince people that a salad can be a meal, it just needs more than lettuce and carrot! Yesterday I made sort of an opposite of your cold salad with cooked vegetables..I sauteed my kale with some salt and a little onion and topped it with leftover cold cubed up sweet potato that I’d roasted with pumpkin pie spice the day before. It’s far from your creations, but the idea was inspired by all of your interesting combinations! a synthetic. Professional can actually discover the start up a single one. Thank you Gena! Walking into the lunchroom at work every January and seeing a group of women eating canned tuna on bagged salad while they read magazines that tell them how to fix themselves always makes me crazy. I love the idea of January as “business as usual”. Being a vegan means we don’t have to start eating healthy, that is how we roll all year long! So true Elaine, I agree! Mmmm, kabocha squash on salad sounds wonderful. Beautiful, too. Your salad looks beautiful, Gena. It’s such a coincidence that I made a salad almost exactly like this for my family at Christmas dinner! The only difference was that I used roasted sweet potato instead of kabocha squash and pomegranate molasses instead of maple syrup in the dressing. There will be plenty of salad eating here too after the holidays! Gorgeous salads and I can never get enough of them! My fave way to get the raw in the winter! Love mixing cooked and raw. Pretty sure sprouts land in or on top of every meal through the winter. Hope you’re having a beautiful holidays! I just figured this out myself. Warm goodies on top of the greens is the key. Also, keeping the apartment a bit warmer encourages me to eat a lot better and more greens. Thanks for sharing this handy fact that seems so simple but also seems to escape common sense for some reason, at least for me it seems to have!